Jem and the Jersey family are real honeys to be around, and we’re not just referring to their luscious golden coats! Jerseys are loved for their quiet, easy-going temperament. They come in many shades of light brown, from beige to dark honey. Their faces are often splashed with a darker brown coat, and many, like our darling Jem, have white markings, sometimes with a heart shape on their forehead. Docile in nature and small in stature, Jem is one of 450,000 Jersey cows currently living in New Zealand. Jerseys have a rather fancy origin, coming from the Island of Jersey, one of the Channel Islands off the coast of France. Jem’s ancestors first graced New Zealand soil in 1862 and today make up 9.3% of New Zealand’s total dairy herd. 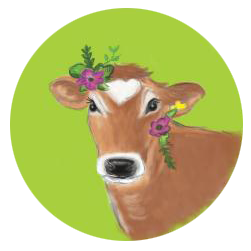 More than just a pretty face, Jersey milk contains more milkfat than other dairy breeds and is rich in protein and minerals. And did you know Jerseys have a special connection to the Royal family? Read more here. Fern belongs to the family officially known as the Holstein Friesian cow. Commonly known as Friesians, they are the world’s most common breed of milking cow, which is probably why their striking black and white coat is the most recognisable cow pattern, featuring on many cow pictures and soft toys. Their strong, robust frame is an admirable quality of the Friesian cow, with the average adult weighing 580kg. 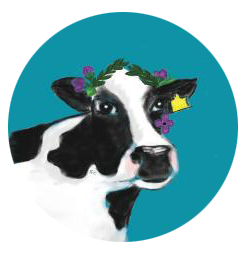 True to their namesake, the Holstein Friesian originated in North Holland and Friesland, arriving in the South Island in 1884 before making their hoofprint on the North Island four years later. Today, Fern and her Friesian family make up 33% of New Zealand’s national dairy herd. Friesians punch high in the average amount of milk they produce, and due to their significant population, produce more milk than any other dairy animal. Aren’t Friesians just Fern-tastic? Allie belongs to the Ayrshire family, and these red beauties are considered to be highly resilient, strong, and adaptable dairy cows. These qualities have made them popular in many different environments around the world. The Ayrshire breed originated across the other side of the world in County Ayr, Scotland, around the early 1800s. They arrived in New Zealand in 1848 with the early European settlers of Otago. While Ayrshires only make up 0.6% of dairy cows in New Zealand, those who breed them are fiercely loyal to the cow, with many affectionately nicknaming the breed “Big Red”. Did you know, it took the Scottish a while to settle on the Ayrshire’s name, with the breed originally called both ‘Dunlop’ and ‘Cunningham’– both places in Ayrshire, Scotland! Meet the artist: Sarah Reinhardt is a graphic designer at DairyNZ, based in Newstead, Hamilton. 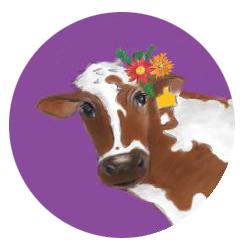 The ‘Cows of NZ’ were hand illustrated by Sarah for the design of limited edition, stunning glass fridge magnets. Sarah says the project was among one of her favourites, and her first project for DairyNZ of designing illustrations by hand.